Shinden Kohyō no Hikan (secret transmission of the divine tiger transformation scroll; 神伝虎変の秘巻) describes five kamae; five aspects of an inner attitude which spontaneously grows within us in an emergency. These structures are collectively called Koteki ryuda Juppō sesshō no Jutsu (虎的竜打十方折衝之術) and defines the art’s oldest and most original forms or kata. In a chronicle, Kusshyo Ratsugi no maki (詳辣技之巻), which is from the year 4 BC, described “Sesshō no Jutsu” as a method for defeating enemies, and it explains the concepts gyaku waza, nage waza and atemi waza . Juppō (Ten Directions; 十方) is a term to define everything that exists around us, in a spherical direction. 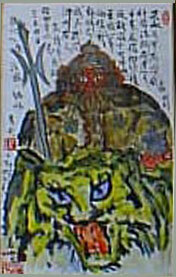 Koteki ryuda (Battle of the Dragon and Tiger; 虎的竜打) is a multifaceted concept that includes the mythological battle between Tiger on earth, and the dragon in heaven. It can be equated with what we term as Kihon Happo. Regardless of the outward form we assume in the event of an acute emergency situation, and whatever happens around us, it has very little to do with what is happening within us. Fukko no kamae is a structure in which one observes the enemy, and then switch to a ferocious tiger fighting. Bōko no kamae is a structure that whips up a mood and then fights. Uko no kamae is an intimidating structure, struggling in the state of sutemi; it is about “eat or be eaten,” feeling in the depths of himself the sacrifice that awaits (the evidential death so others can live). Such sits in his eyes, no matter what happens thereafter. Komochi Tora no kamae is a desperate structure, which is to protect a third party at any price. Gōko no kamae is to bombard at many points against a strong enemy with rain, lightning, and thunder. These five tigers form the foundation for what is usually called the “combative mindset“. “[. . .] Another older Japanese document contains a volume entitled “Shinden Kohyō no Hiken” (“Secret scroll of the divine tradition of tigers’ transformation”), with five entries describing Kamae or fighting attitudes: the Crouching Tiger, Raging tiger, Starving Tiger, Nursing Tiger, and Thundering Tiger. The Crouching Kamae is the form where you lie quietly, watching the movements of the enemy forces with sharp eyes, then suddenly change into a fierce tiger to fight. The Raging Tiger Kamae is the form of a fierce tiger who whips up a wind and fights. The Nursing Tiger Kamae is a desperate form, used when your intention is to protect others at any cost. The Thundering Tiger Kamae is like a bombardment of thunder and rain when faced with a strong enemy. These are collectively known as “Koteki Ryōda (dragons and tigers fighting) Juppō Sesshō no Jutsu,” and are the original forms of the Kata found in Budō. The “Ryūko no Maki” (dragon and tiger scrolls) are a later derivation. Masaaki Hatsumi. The Way of the Ninja: Secret Techniques (2003). Page 178.